The way companies connect with each other to do business can have a big effect on their overall performance. We can sometimes take for granted just how highly connected many businesses are today, and forget how radically this has changed in the past decade, even the past couple of years. The improvements due to better inter-company connectivity can come from soft things such as increasing accuracy, lowering response times and improving customer satisfaction. There are also direct business benefits such as better decision-making, lower inventory requirements, improved forecasting and a reduction in operational costs. These can have a big influence on the fundamentals of the business, such as margins and profits. Business-to-business (B2B) integration covers how different organisations connect and communicate to trade effectively. This typically involves a range of activities such as setting up or configuring partnerships, exchanging information, processing and automating transactions, handling exceptions, as well as the reporting and monitoring of activities. In many organisations, the one with the most significant operational impact is typically transaction processing, as a lack of automation here results in a continuous need for manual attention. Given how important inter-company connectivity can be to competing in today’s tough business environment, when did your company last have a good look at how you go about performing this vital function? 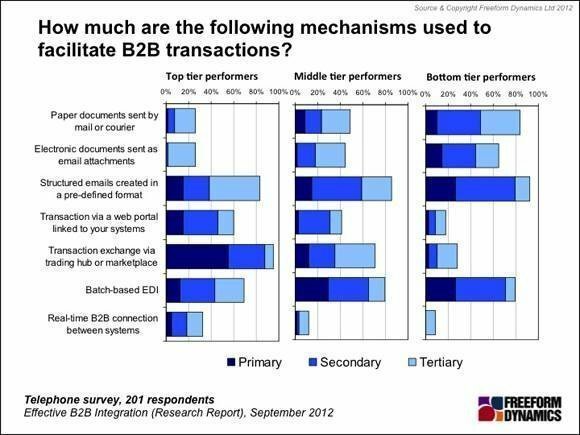 It is tempting to think that B2B integration is well sorted, given how long the capability has been around. 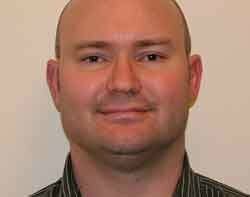 Yet a recent survey conducted by Freeform Dynamics has highlighted that automation is still a major challenge for many companies. Fewer than a quarter of respondents manage to automate more than half of their B2B transactions, with only five organisations out of 201 achieving full automation. The remainder still require a significant amount of manual data entry to process (Figure 1). 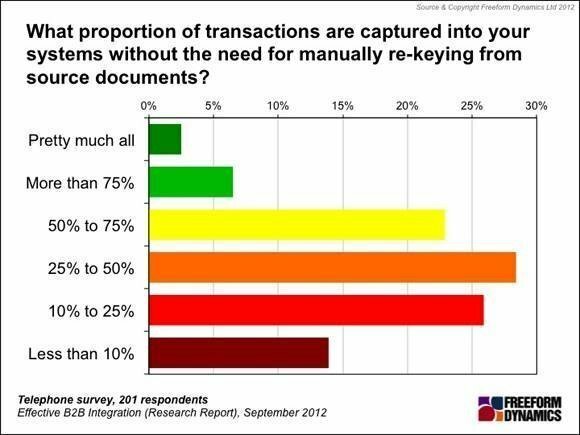 When it comes to processing B2B transactions, a reliance on paper documents for information transfer, or unstructured digital communications, can be a killer for automation. These are guaranteed to require somebody’s time and attention to process, while introducing the opportunity to miss things or get it wrong. When it comes to improving the overall performance of B2B integration, it would be natural to think that a move away from unstructured platforms towards a more predictable way of doing things would be the way to go. This raises the question of what is the correct approach to take to do this? To analyse this further, we segmented the survey respondents into top tier, middle tier and bottom tier performers (for more information on how we created this split see this report), and then looked at the integration platforms they use. If we look at how the top tier performers do B2B integration, there is a marked move away from unstructured communications and legacy systems such as batch EDI. There is still a notable reliance on email, but it is structured to help automation. There is some use of real-time B2B connections, but this has limited impact due to the integration and support demands of point-to-point systems. In particular, the most common approach employed by the top performers tends to use more open mechanisms, particularly the use of trading hubs or marketplaces, as well as web portals linked to internal systems (Figure 2). Of course, reality often trumps theory, and things such as accepted industry practices or regulation may put a limit on how far or fast you may be able to move away from certain established mechanisms. When it comes to how the transaction platforms are implemented, there is a choice between a custom-developed solution or using a more standardised platform. While the custom approach may be favoured as a quick and dirty way to get some integration going, this can lead to a number of problems in scalability and compatibility when trying to bring on more partners across many organisational boundaries. What we see emerging is that the bottom tier performers tend to favour custom solutions and run things in-house. The top tier performers, however, favour a more standardised B2B platform, and are also far more open to having this hosted by a service provider (Figure 3). 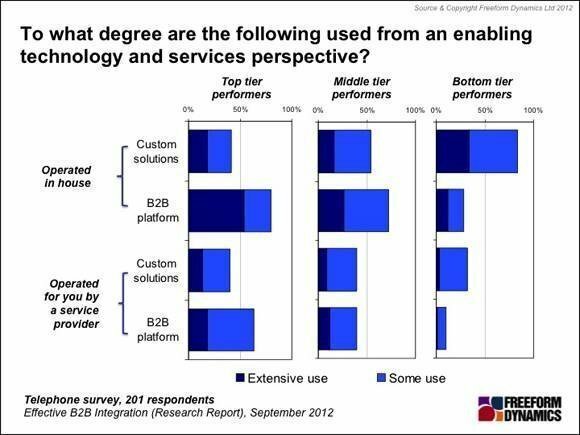 The takeaway from the B2B high flyers is that they are much more inclined to be using a standard platform than a bespoke solution requiring custom integration. Quite a few of them took it a step further and used hosted platforms rather than have to go through the trouble and expense of implementing a platform internally. This has enabled them to get away from the burden of legacy solutions and the limits of quick and dirty implementations to break down the barriers to communications and transactions across organisational boundaries. The under-the-radar nature of much inter-company connectivity often means it does not get the attention of investment it deserves. Given how important this can be to competing effectively in today’s tough business environment, when did your company last have a good look at how you go about performing this vital function?